I imagine it is as unique to each of us; as unique as we are created to be! I, for one, am consistently inspired be folks born way before me. Sometimes I wonder if I should have been born in a genre prior. I do not have a TV, I like simplicity, and I am a quirky old soul. With that said, I am in awe of my precious Grandmother (now 94). She has more grace, style, and loveliness in her pinky finger than I can imagine emulating. When I searched for a logo for my interior design business, I found myself in a quandary. How was I going to brand my business? I adore the fashionable contemporary vibe that is so en vogue now. But could a kitschy or modern logo capture and sustain my business style? 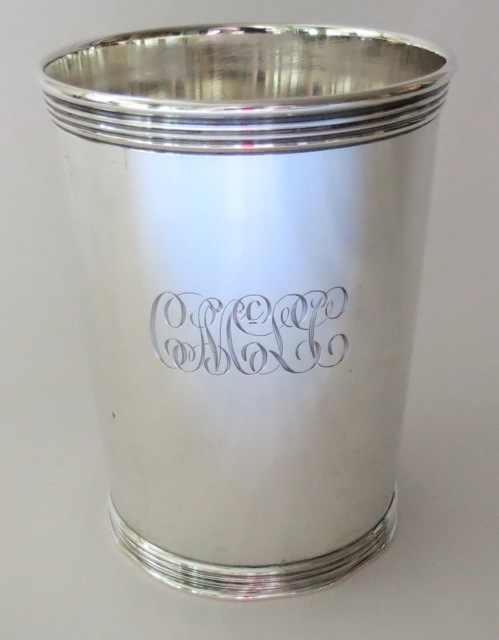 I was forced to go grass roots, and oddly enough found a silver julep cup my Grandmother had hand engraved and presented me upon my birth. My initials were CMcLC (a mouth-full, I know), and that fine lady spared not one initial! So I did as any young Southern Woman would do in search of a logo, I marched into our local stationary shoppe with my Sterling Mint Julep Hand Engraved Cup and my logo was born.